I can't tell you how much I've been looking forward to reviewing this book ever since I picked up last month. Toronto Urban Strolls for Girlfriends is written by Nathalie Prézeau, a Toronto mom who initially wrote and published the book Toronto Fun Places for Families. Now she's published not one, but two books of girlfriend-tested guided walks in the city. Toronto Urban Strolls 1 & 2 both invite you to enjoy life's small pleasures. Lovely walks, decadent treats, whimsical urban sights, coffee breaks and, above all, the joy of catching up with your friends. The book is organized into 28 themed strolls with walking maps and parking/TTC information. What also impresses me is that every page has glossy, colourful pictures of things to see or places to visit on your walk. The walks average about an hour in length and include recommended places to stop either for sight-seeing, shopping, or eating. I'm not a native Torontonian, so I particularly love the idea of being guided through the areas of the city I haven't learned about yet. 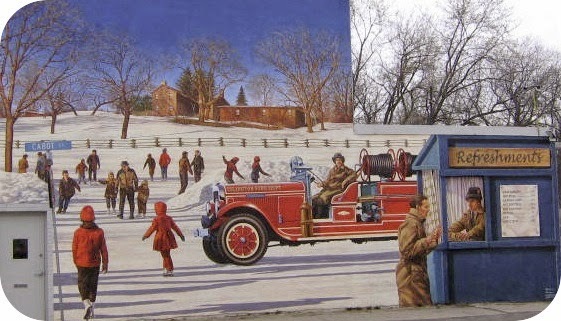 Last week my friend E and I went on the Islington Village Murals Stroll. This is pretty far from my 'hood in the city, so I was excited to check out a brand-new area. The weather was perfect, and after our walk we had a delicious lunch at Village Trattoria. Here are a few pictures of the beautiful murals we saw in the area. I'm already planning to do another stroll soon on our next date night. We like to go for dinner downtown, so I think afterwards we could do one of these walks and stop in at one of the highlighted places for dessert and a nightcap. Paired with Toronto Fun Places, Toronto Urban Strolls for Girlfriends would be a cute baby shower gift, or paired with a gift certificate to one of the guide's recommended restaurants, I think it would also make a unique bridal shower gift. I've already gifted this book once, and while I was shopping with one of my other girlfriends she bought a copy for herself as well. It's one of those books I can't believe I hadn't heard of before this summer. I can't recommend it highly enough. So pick a stroll, grab a friend and/or a latte, and get outside!